I spent hours and hours and days and days cleaning and organizing the studio to get ready for it. I looked through all my paintings and sketches for the past--almost 30 years--selecting the ones that weren't too awful to offer for sale. I put out even my favorites at very low prices, so that people could afford them. I sent out emails to everyone I knew. I gave away fliers at my booth at the Saturday Market. 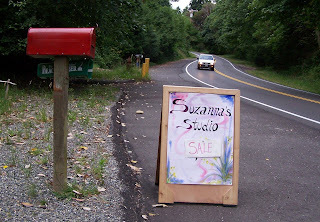 I made a sign, a beautiful sign, that said Suzanna's Studio, SALE, and put it out front. 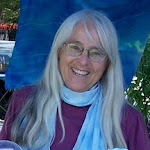 And no one came but one wonderful loyal supporter, who bought two paintings for a total of $30. Thank you, Jill for your support!! I think I need to go cry. OK, Now I'm ready to move on. What did I learn/gain from this experience? After months of putting up with a studio in chaos, my studio is now beautiful and organized! I am proud to invite people in. 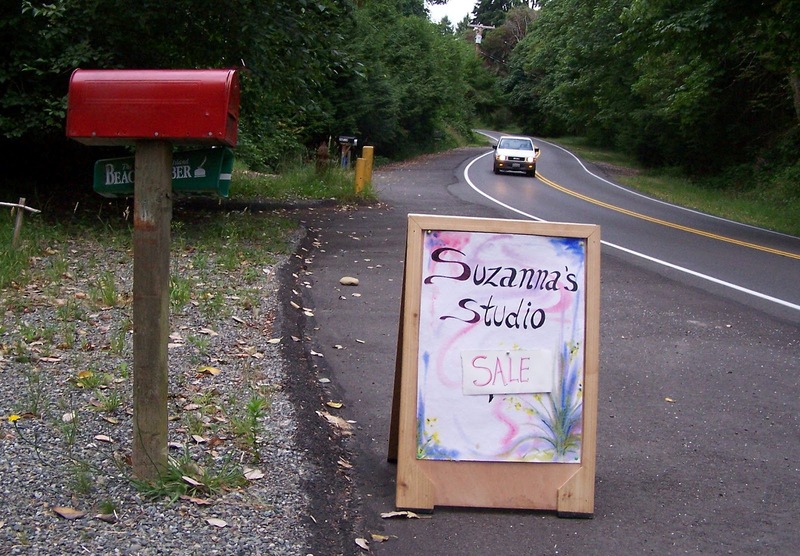 I have a beautiful sign I can put out front to let people know my studio is open. I painted it yesterday after months of having the sandwich board ready but never "getting around to it". I finally realized that I have the materials and experience to do a nice job on paper but was feeling uncertain about painting directly on wood; so I painted on watercolor paper and sprayed it with a sealer. It might not work in a torrential raid, but it works fine in most weather. I looked through almost 30 years of my work and found some I still love. I got to practice letting go of pieces I've held onto for a looooong time! I got to nibble on chips and humus and cherries I had set out for guests, while reading an interesting book, sitting in a comfy chair, surrounded by my beautiful paintings. I learned that I need to plan my promotions strategicaly BEFORE I get immersed in preparing the work for a show. Like about a month ahead of time. I think real mailed invitations mailed about 1.5-2 weeks ahead would have been more effective than email sent a few days before the event. To accomplish this, I need to have them ready to send out about 3 weeks before the event. Plan ahead!! It would have been good to talk about some of the pieces or about the process of going through my work in preparation for the sale, in order to gather interest for it. Flyers around town, ads, and other ways of promotion would have supported a better turnout. Oh Suzanna, you poor thing, I would have cried too! but I love the list of what you learnt from this..... every cloud has a silver lining and you have definately found it. I would have come if I lived even vaguely close to you. I hope your next open studio is a huge success! Oh, teeth-grinding times! There's no doubt that more publicity can help, but sometimes, it just doesn't. I put on a home show a few years ago and only two people came. At this point I don't recall if they bought anything. I sent out emails and cards and people had said they would come. I knew it clashed with a couple of other events, but I thought I'd still get folks. Apparently I was wrong! I live out in the county. The next event I held at a friend's house in town and made several thousand in sales, so I think it does come down to location in many instances. Sounds like you did reap some benefits, nonetheless. Good luck on the next one! Location, planning, what else is happening in the world, and just plain luck! So wonderful that your second show was such a success. Gives me hope!